Interface Polymers Ltd. has been awarded a £638K Innovate UK ‘Plastics Innovation: towards zero waste’industrial research grant to reduce mixed plastic waste by recycling multi-layer flexible plastic packaging back into high value uses. The grant winning project, titled – Polarfin-Blue: compatibilization of polymers to enable recycling – will focus on using Interface Polymers’ proven polyolefin compatibility and surface functionality Polarfin® additive technology to develop next generation polymer alloys, sparking a paradigm shift in mixed plastic recyclability and solving a growing, increasingly costly, worldwide industry problem. Multi-layer plastic films offer added value product packaging performance for industrial and household products, providing major benefits such as extending shelf-life, reducing organic waste and enabling global trading of produce. However, the major problem facing the multibillion dollar packaging industry worldwide is that the majority of the flexible mixed plastic film packaging products currently in use are too difficult and costly to separate and reprocess, other than for limited, low value uses. According to the 2015 Deloitte Sustainability report, of the 31.3 million tonnesof plastic annually produced for the top five usage EU countries, approximately 23% of the plastics packaging waste flows is lost in landfills and 47% is incinerated. The remaining share of low value mixed plastic packaging waste (approximately 30%) is recycled locally or exported. Prior to last year, about 2.7 million tonnesof plastic waste was shipped abroad annually from the EU; to add to the ongoing mixed plastic disposal problem, EU export levels had to dramatically reduce in 2018 due to the introduction of new waste import restrictions from China and other Asian countries. Sociopolitical pressures are building globally to reduce plastic waste and find alternatives that can be recycled, with the EU having set a 55% recyclable target for plastics across all sectors by 2025. New approaches and materials are needed to achieve this ambitious target. Using this Innovate UK grant funding, Interface Polymers intends to develop commercially viable, sustainable solutions to this costly and environmentally unacceptable flexible plastic packaging waste problem. The R & D project team will be using Interface Polymers’ patented Polarfin chemistry to create new Polarfin-Blue additive materials which will enable compatibility between currently incompatible target thermoplastics used in multi-layer packaging (primarily polyolefin/ polyamide/ polystyrene/ EVOH). The objective is to develop new commercial grade Polarfin-Blue compatibilized polymer alloys which will not require a costly, complex, recycling infrastructure to separate multi-layered films, thus providing a viable recycling solution. 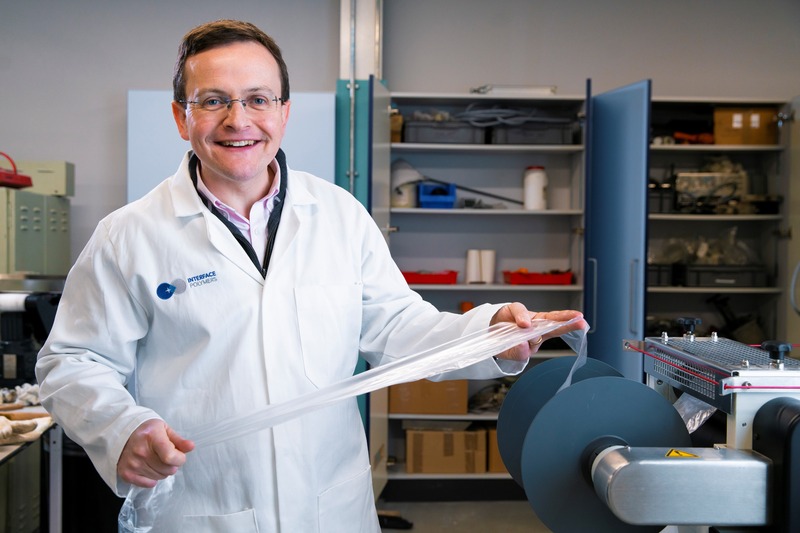 Dr. Kay went on to say: “Our new Polarfin-Blue polymer alloys will make it possible to manufacture new mixed plastic packaging products which can be recycled multiple times by existing separation processes. Additionally, recycled material from Polarfin-Blue polymer alloys will retain mechanical property levels for high value uses and save cost by requiring less virgin material to be used”. Interface Polymers is aiming for its new Polarfin-Blue additives to have inclusion levels of <5% by weight; this will eliminate voids and agglomeration issues and create polymer alloys which demonstrate superior performance properties, even if recycled multiple times, providing a higher value end-of-life material. Simon Waddington, Interface Polymers’ Business Development Director, commented: “This is a global challenge facing all packaging supply chain players and we are actively looking for more partners to work with on this project. Using our unique Polarfin technology, we are looking to develop game changing new products that will create a new and exciting market stretching across and beyond the flexible packaging industry into multiple industrial, construction and consumer markets. We believe that it will provide an opportunity to expand the polyolefin market, which is currently constrained by limitations around compatibility and specific barrier properties, creating an estimated £200m opportunity in the UK alone”. Interface Polymers Ltd., a spin-out from the University of Warwick, was established in February 2016. The company has been developing a range of block copolymer Polarfin additive technology-based products in response to growing customer-led market demands for polyolefin surface functionality and polymer matrix compatibility solutions which can offer enhanced material performance and reduce production costs across a wide range of applications in the packaging, construction, agriculture, automotive and recycling sectors. POLARFIN® is an internationally patented technology and registered trademark of Interface Polymers Ltd.
* Source data: Deloitte Sustainability- Blueprint for plastics packaging waste: Quality sorting & recycling – final report 2015. Our unique Polarfin® additives offer the plastics industry worldwide the ability to transform performance and cost competitiveness in any market application where interfacial compatibility or surface properties are important.